new 65G Walstad tank - with pictures! El Natural Diana Walstad's low-maintenance, soil-based 'El Natural' method for keeping plants and fish. It's pearling like crazy as there are no fish in and I just filled it yesterday. how many plants I need for the tank to be (almost)self sustaining. I'm curious to hear your ideas about it! 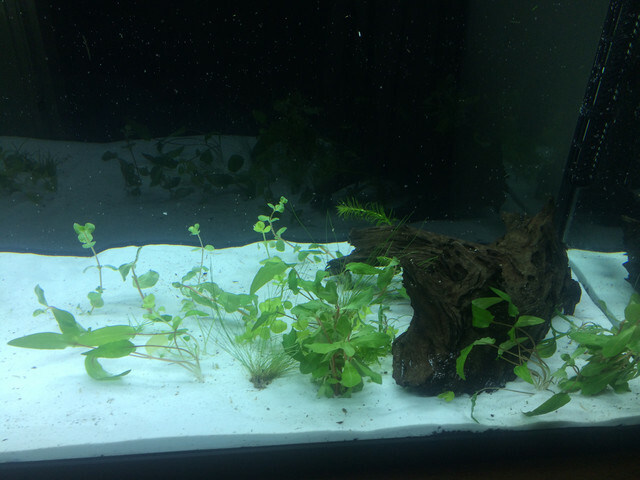 Re: new 65G Walstad tank - with pictures! I suggest that you go ahead and plant the potted ones. It would be very unusual if you found you had "too many plants". In fact El Natural tanks may never see that happen. if possible, I'd like to keep the open space in the center of the tank. I'd love to hear if you think this is enough. It looks like enough to me, but I suspect Diana will comment soon, and give you a much better opinion. I like keeping some open space in the middle, too. Looks good. You can never have enough plants! A small area in front to better see the fish is fine. I set up my 50 gal [in 2008] with a center area in front rimmed with rocks. See photo of tank at 1 week. Worked very well. I didn't put any soil in this front area, just sand. One thing you can do is to lower the water level temporarily. This will make it easier to do water changes and increase the amount of light getting to your young plants. At this time, you don't need 65 gal of water. ......One thing you can do is to lower the water level temporarily. This will make it easier to do water changes and increase the amount of light getting to your young plants. At this time, you don't need 65 gal of water. I am pretty sure that you get less light at the substrate level if you lower the water level. This is because much of the light is from reflection from the glass to air interface. Reducing the water level reduces the reflection, allowing more of the light to escape through the glass. I was amazed when I did some testing with my current light system, and found that the intensity was much greater outside of the center of the tank, not less as I was expecting. Theoretically this is always the case with the glass clean both inside and out. @hoppycalif, thanks for your reply as well!. My reasoning about your measurement is as follows: both uv and ir radiation get absorbed by glass. Even though the visible part of the spectrum may increase because of reflection, the useful part of the spectrum for plants decreases (rapidly) with higher watertable. Even if by total internal reflection both ir and uv radiation make it to the bottom, this will be only under a shallow angle, and will definitely be offset by the (dramatic) loss of radiation through water absorption. see http://www.koppglass.com/blog/optica...lass-interact/ and https://en.wikipedia.org/wiki/Electr...ption_by_water Did you measure the total lux or the intensity of ir and uv separately? I'm interesting to hear what the distribution is of those wavelengths. Water does not significantly absorb light until the depth of the water is around a meter, the absorption of light isn't at all significant at 25 cm, for example. The drop in intensity with distance in an aquarium is just the result of the cone of light causing the area, the energy is in, to get larger proportional to the square of the distance the light travels, no matter what medium it travels through. Very interesting, Hoppy. And explained quite nicely. I may have to borrow my aquarium club's PAR meter to test this. 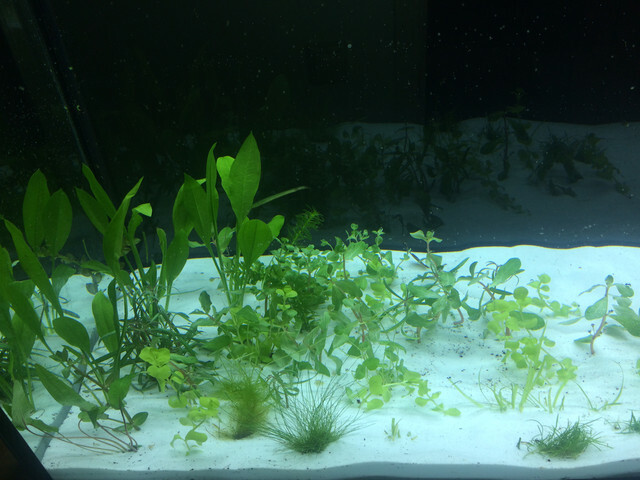 Aquatic Plant Central > General Interest Forums > El Natural > new 65G Walstad tank - with pictures!